Hurrah! The $800k Stretch Goal has been achieved! We know we've been a bit quiet these last couple of days on the Kickstarter front, but things have been far from quiet here at Revolution. After a small celebration on Saturday and a day of rest on Sunday, we have come back to our HQ with renewed energy and inspiration. Thanks to your generosity, the $800,000 stretch goal has been achieved! A massive thank you to all PayPal and Kickstarter backers. With your tremendous support and helpful feedback, Broken Sword - the Serpent's Curse is going to be a truly amazing game! I am sure you'd like to know more about the stretch goal, so we grabbed Charles Cecil, the Director, and asked him the following questions. We've hit the $800,000 Stretch Goal. What does this mean for the game? The game is going to be much more ambitious than we had originally planned. This requires a fair bit of additional design work - but for great reasons. We have added external locations, with associated puzzles and characters - previously I was worried that the game might feel too claustrophobic. We have also added extra characters so that the game structure becomes more free-form - so players have a genuine choice in how they choose to approach puzzles. 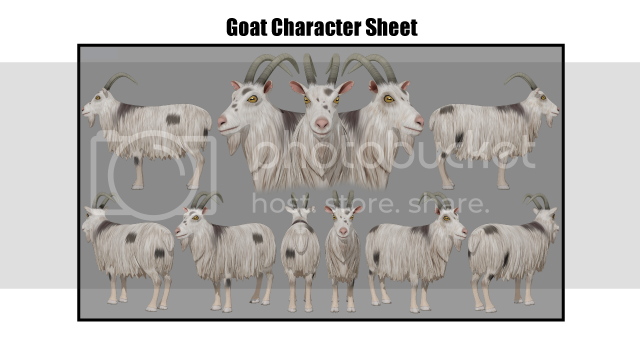 These additional characters will, of course include, amongst many others, Pearl and Duane - and a goat or two (please see character sheet below). We will add subtle sub-stories that are resolved throughout the game. And we will ensure that the logic allows you to play the way you want rather than as suits the game designer - to support this we have city maps which will allow you to visit locations in any order. The second part of the game is now going to be considerably expanded to include that section in the Middle East - so we can promise a really exciting, and explosive ending. The additional design work is going to take a few weeks - so we will keep you informed of decisions that we make and ask your advice where appropriate. We are also creating backer-exclusive forums - again this will take a week or two. In the meantime please do keep an eye on the Broken Sword Facebook page (https://www.facebook.com/brokenswordofficial) - please do 'like' it if you want to receive facebook updates as they are posted. Many of our backers have asked if the stretch goals will cause a delay. Will we still make the game in time for April 2013? Our top priority is to deliver all aspects of what we have promised. We are adding considerable amounts of content and will do our best to ensure that this doesn't delay completion. Once we complete the updated design then we will revise the schedule. Again, we will let you know our conclusions and ask you for your thoughts. Only to thank everyone, once again, and to say how much we look forward to working with you over the next six month. I also really wish you would keep posting all updates here at KS. I've backed a lot of games and having to go to and register at 30+ outside sites to keep up with those projects is pretty cumbersome. Especially when every site has its own rules about what makes an acceptable user name and password. I have a pretty good memory, but not good enough to keep track of 30+ (and counting) different logins. Quote: @Kirill Milovidov "I don't use Facebook, any chance getting updates on twitter or something?" +1 for that, I don't use Facebook either, and really don't want to miss out. An RSS update feed, Twitter, Emails, or anything else would be fantastic! I think nobody will mind if the release time would get pushed a little. It'd be better to get the 100% finished and polished game a bit later than try to rush it in at the end. personally I think the goat looks too realistic. loosen up a bit, it's not that because you are making HD it can't look a bit sillier then this. Also animation is a lot harder on realistic animals,then idealized ones. I don't use Facebook, any chance getting updates on twitter or something? Just dropping in to say that I am too in favor of waiting a little (or maybe even a lot) longer for a fully finished game rather than insisting on you making the deadline of April next year. Here's to an excellent adventure in the making! Plus one vote for not rushing it. Will it be possible to start sending us games like Broken sword 1, 2 and other titles (as long as we pledged enough) running up to the release of this new title? No rush... Well, I want it now! But I want it right so take *enough* time and I will be happy. After all, a game can either be great eventually or terrible forever. I concur - take your time, don´t rush finishing the game. I´m so glad that what we´ll see will be actual Director´s Cut version of the game, thanks to 800 000 stretch goal hit! Really looking forward to play this game! Take your time to completely finish the game. I don't like the idea of splitting the game. The long awaited update confirmation on the 800k stretch goal! Thanks REV! Yes, created juices cannot be rushed.. so no worries on that. We are willing to wait for the best broken sword game ever! I'm quite used to things taking their time, and also won't mind if you can't make the April deadline. I have to disagree with those asking for the game to be split in two though. @Jack: How do you know BaSS 2 is happening anyway? Has Revolution Soft said anything? And take your time to make and polish the game. I rather have a delayed diamond than a hurried piece of coal. P&d. My life is complete! why not split the game to two parts so we won't be disappointed with the delay? this would also help by not making the game seem like in development hell. This is going to be amazing..
And here was me thinking you took all our money and had a legendary piss up, j/k but really can't wait for this game but if there must be delays then let there be delays, I'd rather have it right then have it right now. Also since this KS I've noticed goats are everywhere, they have taken over Skyrim. Sounds great! As with the general consensus, take all the time you need until you're really confident you have the game how you want. - Hire some people to help you to add the additionnal content. - Take the time that you need. - Or cut the game in two part, something like Telltale Games doing with their game, you deliver the first part for April and the second one later. Awesome news guys! And in the spirit of all the other commenters - take whatever time you need to make the game we all want. agree with the rest of the comments :D take your time and do it as best as you can ! Guys and girls at Revolution...just take your time to made best Broken Sword ever. Don't rush anything. How long has it been since the LAST Broken Sword game? I think we can afford to wait another year. @Pedro Rodrigues: Actually BaSS2 is happening anyway! I agree with taking your time to do things properly. Take all the time you need. You got a couple of months anyway if you still want to release ahead of some big blockbusters. I'm so thrilled about getting to explore cities at my pace.